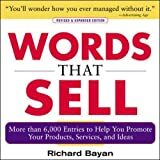 More Words That Sell is packed with 3,500high-powered, idea-generating words, phrases, and slogans, arranged by category and purpose (example categories include Power Words, Sounds, Technology, Youth Market, and dozens more). Containing checklists and other helpful features like its bestselling predecessor Words That Sell--but with literally no overlapping words--it will be valuable for devotees of that classic book and new fans. Color names beyond just red, white, blue, yellow, etc. 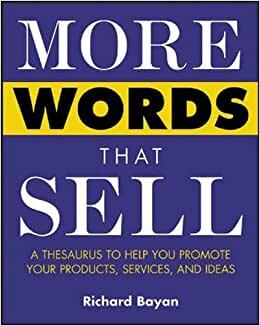 With all words reflecting current use in advertising and media, and sections covering internet marketing and advertising, More Words That Sell will be a must-have word and-phrase reference for writers of all types. Richard Bayan is a freelance writer who spent over two decades as an award-winning advertising copywriter and copy chief. He is the author of the bestselling Words that Sell, The Cynic's Dictionary, and more than 150 online columns and essays. I like ease of use best. Covers a wide range of different types of sales. More for closing with one to one . However I was looking more for writing text for selling fine art. I actually miss ordered. WORDS THAT SELL would had been the better choice for me. I looked at it before and it was more beneficial for what I do. If you are in a high tech business this is the one for you. I kept this book because there are still a few thin gs that are helpful to me still. Write great product descriptions and any other sales writing with ease using this book. The index makes it a snap to find the word you want. Probaby useful for any writing actually. In today's highly competitive, quick-hitting marketplace, choosing the correct words is vital to the success of your message-far too vital to be left too chance! 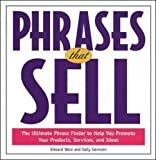 "More Words that Sell" provides you with more than 3500 high-powered, high-profit words, phrases, and slogan that have proved their ability to hold readers' attention as you deliver your message and to persuade them to respond. Taking up where the bestselling "Words That Sell" left off, this book supplies you with all-new tools for fine-tuning your copy and hitting the hot buttons of your target audience. Nearly thirty alphabetically arranged, special-purpose categories help you quickly locate exactly the words you need to: (1). Make readers feel your message instead of just reading it; (2). Add muscle to your copy by using powerful verbs and adjectives; (3). Find the right words and phrases for niche markets; (4). Boost results by using words that appeal to basic human needs; (5). Invite interaction from website visitors-and bring those visitors back; (6). Create a favorable impression with resume and cover letters as well as with general business correspondence such as reports and memos; and (6). Use colour, fragrance, sounds, and textures for vivid sensory appeal. Ask any veteran writer and you'll be told that one word can make or break a message. Finding that word under the pressure of a tight deadline, however, can be difficult if not impossible. Let this book help you choose the words that will boost the effectiveness and profitability of your message-whether you're promoting products, ideas, your business or yourself. 5.0 颗星，最多 5 颗星Fantastic book!